This type of sonic bomb alarm clock is for all. Any age group can make use of it, if they think they cannot get up in the morning of their own. This alarm clock is designed with certain heavy features which will shake your windows pretty sure to make you wake in the early morning. Even if you are not convinced by that, the alert lights and the ultra-vibration unit will do the rest of the work. The harsh and the throbbing lights will surely make your eyes pop. 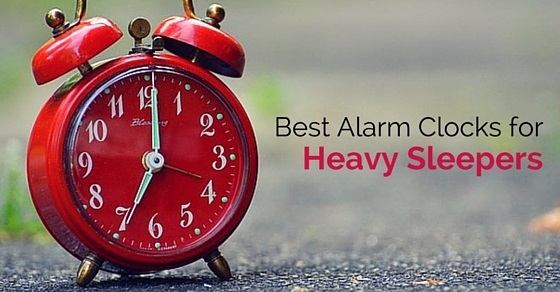 This is one of the best alarm clock for the heavy sleepers. This is one of the most irritating alarm clocks you would ever come across. This clock will continue abusing until you step the feet on the floor in the morning. It suits the personality of heavy sleepers. This alarm clock is designed as a man standing erect, giving a stern look. It is also a good piece to keep as a decorative item. If you need something really effective and unique alarm clocks to wake you up, then reach out to this alarm clock. This will surely wake you up in the morning. This clock works in a manner that the moment it reaches the set time, it starts to howl with the propeller flying up and aside. The only way to stop the propeller is to get out of the bed, grab it and place it back into the deck. In short you will need to get out of the bed to get rid of the annoying siren of the clock. This as the name says, suits best for those who are lazy enough to do any work when they get up. It is easy to just shut the alarm with half open eyes and going back to sleep again, but this is not the case with this alarm clock as it checks your shooting skills. Once the alarm clock starts beeping, you are required to hit the target and if the target is right, the alarm clock stops beeping. Not just this, this also has a feature of recording your own customized message to make it little familiar. The fire bell alarm clock is very funny and cute. This alarm clock rings like a fire alarm and not only it wakes you up but your entire household. So, better to use it with precaution or you may have to suffer the brunt scoldings from everyone in the house. To turn off this kind of alarm clock, you will have to hit the flashlights in the eyes or you will not find any other way to continue with your sleep. This challenge not only wakes up your mind, but also the body. The lethargic feeling of getting up early is gone after you open the eyes wide to hit the bully’s eyes with a flashlight. The silent alarm clock actually is for those who hate the annoying sound of the alarm while you are enjoying the most peaceful moment of your life. This alarm clock works in a manner that tells you to put a wireless rubber band on your hand that is given with an haptic alarm which has an inbuilt device that vibrates. In order to activate snooze button, you will be required to shake the alarm clock and if you feel like it is not enough, more moment will be needed every consecutive time, making you wake up in time. This alarm clock will make you lose your wealth if you will set the alarm clock on snooze. This alarm clock connects through a wi-fi to your bank account that gifts certain amount of money to the organization per snooze. This is a cool alarm clock for those who are stubborn sleepers. This clock is best for the foodie people who could smell the fragrance of food and run to that place. This alarm clock wakes you up with a mouth watering aroma of bacon. This alarm clock gives you the aroma so effective that the sleeper tends to get up from the bed even if he or she does not wish to. Robots are invading into our lives slowly and now has reached to bed in the form of alarm clocks. It is a cool clock for the adamant sleepers that requires to get off the nightstand, roam around the room and continues to ring until you catch it up. You will get up quite easily though, after it is done without making use of the snooze button. The carpet alarm clock will certainly help in opening your eyes as the clock will never stop ringing, making you feel irritated. The carpet alarm clock requires you to get up and step on it to shut the irritating tone of the alarm. This alarm clock also has an LCD display on it to show the time on it, so don’t get shocked, it actually is an alarm clock. What can be more irritating than hearing the police siren early in the morning with the harsh lights flashing in your eyes? This type of alarm clock will succeed in waking you up when all others will fail. This is good to use for the hard and the heaviest sleepers. Not just this, it is designed also in a shape and colour of the police siren used on the top of the cars. This type of alarm clock is good for those who are fitness freak. If you have paid to the gym for exercising equipment’s and are thinking that all the money goes into vain as you are unable to wake up for the morning alarm, then need not worry, there is an alarm clock designed for such purpose only. For this alarm clock, you need to wake up and you cannot simply hit the snooze button on it, but it will require you to do thirty curls. So, by the time you are done with the task, you will feel active and will not want to move to the bed again. The very renowned and a common saying time is money is heard and known to all, indeed it is also true to a maximum extent. This alarm clock has a display which will make noise the moment time starts. To stop it you will have to involve in bribery with the alarm clock by giving extra money every single second. There comes s relation between the time and money when you make use of such alarm clock. The defusable alarm clock is akin to other clock which will function like the regular clocks like the beeping, snoozing etc., but the moment you will press the red button on the clock, you will see a count down, similar to what is shown in the movies. This alarm clock is given with four different wires on it’s top. On the button press set time, you will be required to set the time and cut one of the wires within ten seconds. Every wire has a different role like one wire is to halt the countdown, others are for having zero effects while the others are for detecting the devices. Evey time the role of wires changes so, it is something new every time. This alarm clock is highly pocket friendly and very compact in size. This alarm clock allows you to set two alarms at a time. This alarm clock is set up with a large display, with the easily accessible snooze button. Not just this, it also allows you to get up either with a easy buzzer or to the morning radio show. So, in this way it differs from other alarm clocks. This device can also be called as clock radio or radio alarm clock. This projection alarm clock is stylish and very smart as it automatically restores the current time and sets the time in case there is a power interruption. This magnosonic MAG MM176K alarm clock is designed with easy features like dual alarm, a date display, temperature gauge. As it is built with a feature to rotate it to 180 degree, users will be able to project the current time on the wall. It is designed to make you grow like a child. It is interactive and has a night light that is very convenient. This alarm clock has in built time teaching game, thus a learning device for the children, as it has both the analogue and digital clock features to present the time. It also gives you colour changing options like from yellow to the green light and so on. You might be in your deep slumber, but wouldn’t you wake up when you hear a harsh sound blending with the favorite song, of course yes, you would like to stop it. There are options like would you like to wake up with harsh and screaming sound or something like vacation mood tone. This alarm clock comes with two batteries and in different funky colors with the plastic pebbles inside to make it look more attractive. This alarm clock also requires you to get out of your bed and place the rocket at it’s place. For this alarm clock, you will require to get out and in order to shut the buzzing of the alarm, you will have to position the rocket that flew away, into it’s required place, or the alarm will continue to create noise. This is almost similar to the wi-fi alarm clock. For this alarm clock to function you are required to, connect the wi-fi with our bank account and the bank account is connected to the charity which goes against the views you have. So, whenever you will press the snooze button, the bank will donate some amount of hard earned money to that specific charity. It is very practical and innovative in use. It gives you a feature of connecting it to the smart phone with USB for charging. With both the loud and the soft buzzer option, its good for the heavy sleepers. So, above are some of the wake up alarm clocks designed for the heavy sleepers. If you do not like the voice of a baby crying, the drill machine, the noise children make and many more, then you need to know there are many alarm clocks with even harsh and irritating sounds that are enough to wake the stubborn one’s in the morning. Everyone loves sleep, but it becomes mandatory to get for the work you meant to do, so if you feel like not able to get up , then reach out to the above alarm clocks and be punctual to the work place.